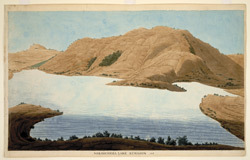 Watercolour by Hyder Young Hearsey (1782-1840), of Naukuchi Tal, the Lake with Nine Corners, two miles east of Bhim Tal, in Uttar Pradesh, dated 1815. This lake, one of the most indented and prettiest of the Kumaon lakes, is surrounded on three sides by high hills and with oak woods coming down to the water's edge. Hearsey accompanied two expeditions, through the hill country and into Tibet, to discover the source of the Ganges. The first was in 1808 with Lieutenant Webb and Captain Raper. During the second, in 1812, he and William Moorcroft became the first Europeans to reach the sacred lake of Manasarowar. During the Nepal War Hearsey commanded a small body of irregulars and captured Champavat in March 1815. He later gravely underestimated the fighting power of the Gurkhas, and was wounded, captured and imprisoned at Almora, the Kumaon capital, until its surrender at the end of April of that year.